Ashton Kutcher told Conan O'Brien the way he and Mila Kunis decided on a baby name for their new little girl. Hollywood parents are known for their unusual, if not full-on wacky, baby name choices (Moxie Crimefighter or Pilot Inspektor, anyone? 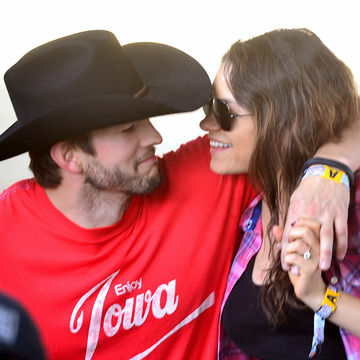 ), but while Ashton Kutcher and Mila Kunis opted for a unique moniker for their baby girl, born Oct. 1, we have to say, it's a pretty cute one. Kutcher told Conan O'Brien Tuesday that Wyatt Isabelle wasn't their first choice, but that the couple's original name for the little girl just didn't fit. "I had to get the creative juices going," Kutcher told the late night talk show host, "so we were going to a Lakers game and I got name Tourette's, and I just started listing off anything and everything that I saw. I was like, 'sign, truck, wall, door.' She (was) like, 'Shut up!' ... Then I was like, 'I've got a really dumb idea. What about Wyatt?' And she goes, 'That's it.'" Kutcher told O'Brien Isabelle, which, according to NameBerry means "pledged to God", is in honor of Kunis's grandfather, Yitzhak. Wyatt means "brave in war" and has English surname origins. Wyatt, according to the Social Security Administration, ranked as the 41st most popular name for boys in 2013, its highest ranking since 2000, but did not crack the top 1,000 female names in the last 14 years. Isabelle, meanwhile, ranked 115 last year (although its popular cousin, Isabella, was the fourth most popular name in 2013). And, the tech-savvy parents have already jumped on scoring domain names, a Twitter handle, an Instagram account and an email address for little Wyatt. "We write her emails," Kutcher told O'Brien. "One day she'll be able to look at it and see the kinds of things people had to say."